Custom one-piece shields offer outstanding attenuation combined with excellent coplanarity for ease of assembly. 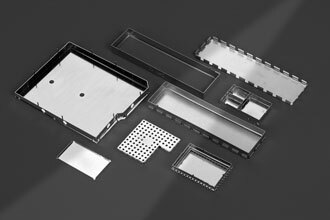 These can be shipped fully formed or flat pack for self-assembly, either manually or with soft tooling. They can be virtually any size and can incorporate a wide variety of design features to enhance performance and ease of use. Seam soldering is also available for complete can integrity, if required. Custom circuit board shielding cans with removable lids are designed to protect sensitive components from noise while giving access for rework and adjustments. Removable fingered lids provide easy access to the enclosure contents and high attenuation in service. A multi-compartmental screening can is an effective alternative to multiple shields. It is cost effective to produce and offers significant savings in terms of initial cost, assembly time and real estate management. 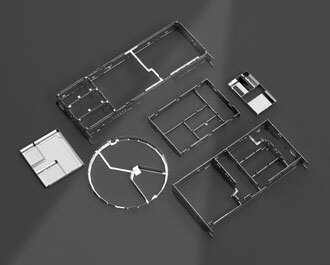 A matrix of walls, all folding easily from a single sheet and complemented with a separate lid, provides an efficient enclosure with enhanced accessibility for rework or the tuning of devices.